On 31 August, the United States announced that it will provide no additional funding to UNRWA. I express deep regret and disappointment at the nature of the US decision – which affects one of the most robust and rewarding partnerships in the humanitarian and development fields – and unreservedly reject its accompanying narrative. At the outset, I wish to convey – with confidence and steadfast determination – to Palestine refugees in the West Bank, including East Jerusalem, in Gaza, Jordan, Lebanon and Syria, that our operations will continue and our Agency prevail. At the heart of our mission lie the dignity and rights of a very anguished and profoundly unsettled community. The funding decision of an individual member state – albeit our historically most generous and consistent donor – will not modify or impact the energy and passion with which we approach our role and responsibility towards Palestine refugees. It will only strengthen our resolve. To my colleagues – both Palestinian and international – I confirm that we will apply ourselves with every shred of energy and creativity to continue meeting the needs of the community and preserve our vital services. All staff will be at their duty stations, and will keep our installations open and safe. It is crucial to project the strongest sense of unity and purpose. 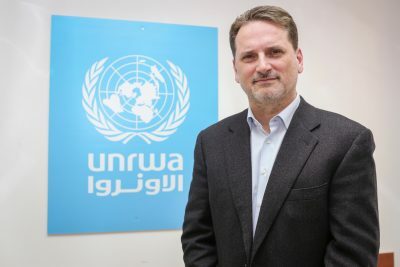 UNRWA’s remarkable history is made up of millions of acts of selflessness and courage in one the world’s most polarized and emotionally charged regions of the planet. I am proud and honored to lead this dynamic agency and wish to pay tribute to the dozens of colleagues whose lives were lost in recent years, in particular in Gaza, Syria and the West Bank. We were created in 1949 to provide assistance and protection of rights of Palestine refugees, pending a just and lasting solution to their plight. This was – and firmly remains – the expression of the collective will of the international community and the General Assembly of the United Nations has consistently praised the human development results achieved by the Agency and extended its mandate. The World Bank has called our education system a “global public good”. The need for humanitarian action arises from the extreme violence, pain, suffering and injustice caused by war. In the case of Palestine refugees, this was caused by forced displacement, dispossession, loss of homes and livelihoods, as well as by statelessness and occupation. No matter how often attempts are made to minimize or delegitimize the individual and collective experiences of Palestine refugees, the undeniable fact remains that they have rights under international law and represent a community of 5.4 Million men, women and children who cannot simply be wished away. The responsibility for the protracted nature of the Palestine refugee-hood, the growing number of refugees and the growth in needs, lies squarely with the parties and in the international community’s lack of will or utter inability to bring about a negotiated and peaceful resolution of the conflict between Israel and Palestine. The attempt to make UNRWA somehow responsible for perpetuating the crisis is disingenuous at best. There is sadly nothing unique in the protracted nature of the Palestine refugee crisis. Refugees in places like Afghanistan, Sudan, Somalia, Congo and beyond have also experienced decades of displacement and lack of resolution. Their children and grand-children are similarly recognized as refugees and assisted by UNHCR. Enshrined in the principle of humanity and the international law norm of family unity is the commitment to continue serving communities affected by war until a political solution has been found. It is the failure to end conflicts that prolongs refugee situations and denies refugees the choice to define a dignified future of their own. In January 2018, the US announced that its annual contribution to UNRWA would be $60 M. We acknowledged this important funding at the time but also highlighted the fact that it represented a $300 M reduction in income, which confronted our organization with an existential crisis. At no time over the past eight months were we notified of the specific reasons for the dramatic cut. It appeared clearly related however to the tensions between the United States and the Palestinian leadership following the US announcement on Jerusalem and not to UNRWA’s performance. It therefore represented an evident politicization of humanitarian aid. The announcement made yesterday further challenges the notion that humanitarian funding should be depoliticized. It risks undermining the foundations of the international multi-lateral and humanitarian systems. It is a radical departure from almost 7 decades of genuine – if at times critical – US support to our Agency and is inconsistent with the cooperation agreement signed in early December 2017 between the United States and UNRWA, in which the US recognized the robustness and integrity of our management of the organization and its resources and how we address our multiple operational, security and financial challenges. Our commitment to accountability, strict and sound financial discipline, to setting priorities and acting decisively when the Agency’s neutrality is challenged, are matters of public record. In 2018, UNRWA introduced stringent management measures as its own necessary contribution to overcoming the financial crisis. We have also achieved remarkable results in terms of diversification and expanding partnerships. I want here to acknowledge with deep appreciation the over 25 countries that advanced their expected annual contributions to earlier in the year to help us sustain operations. I wish also to express immense gratitude to the 30 donors who have provided additional contributions to UNRWA’s core and emergency activities this year and those who have signed new multi-year agreements with us. I wish to highlight with particular emphasis the generous donations made by Gulf countries, specifically the State of Qatar, the Kingdom of Saudi Arabia and United Arab Emirates, as well as the historic support from the State of Kuwait. We are still in critical need of over $200 M to survive this year’s crisis and call on donors to sustain the collective mobilization to succeed in this crucial endeavor. I am indebted to the Secretary General of the United Nations, António Guterres, for his trust and leadership in mobilizing support for our Agency. I wish to sincerely thank all host countries for their tireless efforts, as illustrated with particular vigor and dedication by the Hashemite Kingdom of Jordan and by Palestine. The commitment shown respectively by Egypt and by Turkey as successive chairs of UNRWA’s Advisory Commission is also recognized. When we opened the school year on time this week – with the admirable support of our partners – and 526’000 girls and boys returned to classrooms in our 711 schools in the region, it was a moment of celebration, pride and hope. UNRWA does not pay lip service when it comes to the right to education, to empowering young girls, to developing critical thinking and teaching tolerance and human rights. There is nothing artificial in our commitment to the preservation of opportunities and rights. We act concretely on these difficult front-lines, committed to upholding the integrity of our mandate and striving for high standards in our education, health, relief and social services and emergency response. I say again to all Palestine refugees: we will not fail you. Our partnership with you is stronger than ever. Your Dignity is Priceless.